Above, volunteer pilot Steve Koch prepares to fly for Agape Flights, which carries mail and supplies to missionaries in disadvantaged areas. Below, missionaries unload supplies from Agape Flights' Bandit aircraft. Photos from Agape Flights. VENICE -- In January 2010, a catastrophic 7.0 magnitude earthquake devastated Haiti, its epicenter about 16 miles from the capital of Port-au-Prince. Within 36 hours, food, water and medical supplies were on the way from Agape Flights’ hangar in Venice to the people in Haiti. 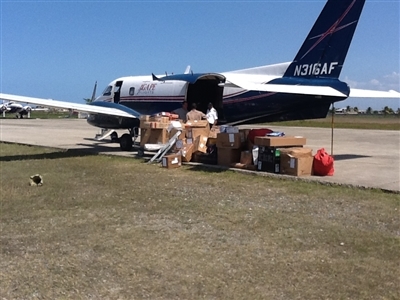 Within 90 days, the nonprofit, nondenominational ministry flew 150 relief flights, delivering more than 500,000 pounds of donated emergency and medical supplies. The relationship between Agape Flights and the missionaries it serves never had been more important than in the earthquake’s aftermath, said Carole Leman, Agape’s director of development. Those results stemmed from a partnership more than 30 years in the making, and one that has strong support among United Methodist churches in the Florida Conference and beyond. In the 1970s, Agape Flights cofounders Keith and Clara Starkey traveled as field missionaries to Haiti and found missions crippled by a dearth of supplies. As mail went through customs, checks and material goods often disappeared. “They really couldn’t get the supplies they needed to do their missions,” said Clara Starkey. The Starkeys, then living in Bradenton, seized on the idea of fighting disease and poverty in Haiti by providing food, clothing and medical supplies to various missions and hospitals. They mortgaged their house, bought a plane, found a volunteer pilot and named the aviation ministry Agape, the Greek word for God’s unconditional love. On Nov. 15, 1980, the ministry’s first flight headed to Cap-Haitien, Haiti, bearing supplies for a missionary family. Within two months, Agape was supplying 25 missionary families. In its first year, the ministry made 30 nine-hour roundtrip flights to Haiti, the Starkeys said. The ministry has since added stops in the Dominican Republic and Bahamas. It now delivers cargo weekly to 350 missionaries and their families. “Right from the beginning, we were allowed to take things in to the missionaries without going through customs,” Clara Starkey said. 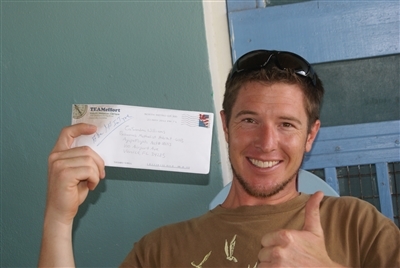 Abraham McIntyre, above, is a missionary with Bahamas Methodist Habitat who gets mail and supplies through Agape Flights. 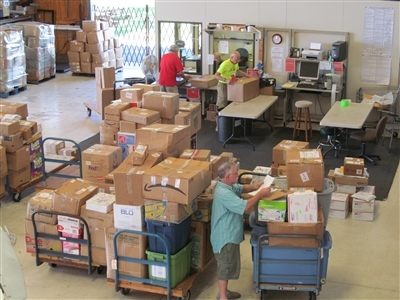 Below, workers at Agape Flights headquarters in Venice get cargo and packages ready to ship to missionaries in the Caribbean islands. For almost nine years, the Starkeys used their home for sorting and packaging mail and supplies. Agape's headquarters later moved to what is now Sarasota International Airport and then to Venice in January 2007. The Starkeys, now in their 80s and retired, worked hard in the early years to fly missions as promised and ensure pilot safety in a time before cell phone and Internet communications. Steve Koch, a volunteer pilot and current Agape board chairman, said challenges remain in less advanced countries. He recalled a trip the day before Hurricane Isaac hit Hispaniola and Cuba in August 2012. His plans included three routine stops and an extra visit to Ragged Island in the Bahamas. “We were sweating this hurricane,” Koch said. “We had to beat the hurricane out. It was a very demanding flight.” The aircraft made all four stops and returned to Venice the same day. Hurricane Isaac hit the next morning. The rewards are worth the risks, Koch said. 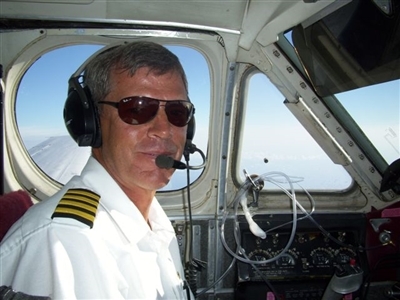 A commercial pilot for 43 years, he estimates he has flown 125 Agape missions since he began volunteering in 2008. “I feel blessed beyond measure to be able to do what I do to serve the Lord,” the pilot said. Serving in some of the poorest areas of the Western Hemisphere, missionaries typically work to provide clean water, community health, education, evangelism, medical services, micro-lending enterprises, orphan care and vocational training. 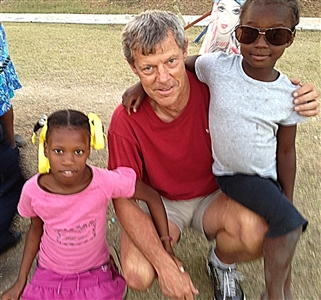 Agape Flights pilot Steve Koch spends time with some children he met while delivering supplies in Haiti. Leman said missionaries become Agape members to meet Federal Aviation Administration requirements and also serve as the network on the ground, taking turns to meet the plane and distribute mail and cargo. An annual membership costs $100 and covers mail for one year. Missionaries also contribute $1.75 per pound toward the total cost of $4 per pound of cargo flown. Sponsoring churches and individuals often pay the missionaries' share, Leman said. Agape regularly flies into Eleuthera, Bahamas; Cap-Haitien, Port-au-Prince and Les Cayes in Haiti; and Santo Domingo and Santiago in the Dominican Republic. Its plane, an Embraer 110, or Bandit, carries a cargo of 3,000 pounds that can include anything from mail to goats, seeds to motorcycles, furniture to clothing. The 1,700-mile roundtrip to Port-au-Prince costs $4,500 in fuel, not including aircraft upkeep, Leman said. Besides two volunteer pilots, 70 to 75 people volunteer weekly at the Venice headquarters, sorting mail, loading the plane, performing maintenance or cleaning the facility. Among them is Grace Horn, a member of Venice-Nokomis UMC, who has been the volunteer receptionist since 2007. “Being here with the staff and the other volunteers, it’s like God’s presence is here always and you can feel it,” she said. Other Florida Conference churches supporting the ministry include Boca Grande, Christ and Grace in Venice, Emmanuel and First n Bradenton, Englewood, First and Trinity in Sarasota and St. Paul in Largo. UM churches in Ohio, New York and New Jersey also support the ministry. For information, call Agape Flights at (941) 488-0990, email GoMissions@agapeflights.com or visit www.agapeflights.com. -- Bonnie Dyson is a freelance writer based in the Tampa area.